Our slicer knives make it very convenient for you to slice ham, roast beef, or fish, thanks to their amazingly flexible body. Longer and narrower than your carving knife, these slicer knives are sure to bring more efficiency in your daily cooking. Made from the best quality material, they are ideal for use in restaurants, home kitchens, bakeries, and meat processing units. Our slicer knives are available with plain, wavy or granton edge blades. These blades feature either a straight edge or serrated edge. They are constructed from high carbon stainless steel and will not discolor or stain even after years of continuous use. The handles of these slicer knives are available in a variety of colors. You can choose among wood, rosewood, Fibrox and POM (plastic over molded) handles. The durable rosewood handle is ergonomically designed to help minimize tension at the wrist. The rosewood wooden handle knives are rustic and elegant kitchen knives that look great on the kitchen counter. A slicer serves a similar function to a carving knife, although it is generally longer and narrower. Slicers are often more flexible and as such are better suited for slicing ham or fish. The durable rosewood handle is ergonomically designed to help minimize tension at the wrist. The rosewood wooden handle knives are rustic and elegant kitchen knives that look great on the kitchen counter A slicer serves a similar function to a carving knife, although it is generally longer and narrower. Slicers are often more flexible and as such are better suited for slicing ham or fish. A slicing knife is similar to a carving knife, but it is generally longer and narrower, which it makes it better suited for slicing softer meats. For perfect slices try Victorinox Precise Slice Left-handed Knife (model 45961) or Victorinox Precise Slice Right-handed Knife (model 45960) The Fibrox handle is ergonomic with nonslip safety grip. The handle and serving knife are both National Sanitation Foundation (NSF) approved. The durable rosewood handle is ergonomically designed to help minimize tension at the wrist. The rosewood wooden handle knives are rustic and elegant kitchen knives that look great on the kitchen counter A slicer serves a similar function to a carving knife, although it is generally longer and narrower. This slicer is designed for roast beef and pot roast. 3/16" Thick Blade. 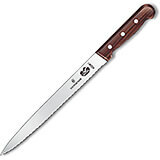 The durable rosewood handle is ergonomically designed to help minimize tension at the wrist. The rosewood wooden handle knives are rustic and elegant kitchen knives that look great on the kitchen counter. A slicer serves a similar function to a carving knife, although it is generally longer and narrower. Slicers are often more flexible and as such are better suited for slicing ham or fish. The granton blade helps meat fall away from the blade as it cuts. The durable rosewood handle is ergonomically designed to help minimize tension at the wrist. 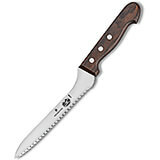 The rosewood wooden handle knives are rustic and elegant kitchen knives that look great on the kitchen counter. 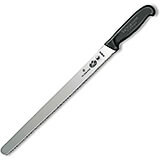 A slicer serves a similar function to a carving knife, although it is generally longer and narrower. Slicers are often more flexible and as such are better suited for slicing ham or fish. The granton blade helps meat fall away from the blade as it cuts. Black, Forged Carbon Steel Ham Slicing Knife, 10.25"
The Paderno World Cuisine 10 1/4 inch ham slicing knife has a forged blade constructed of a special steel and carbon alloy which insures a perfect cut and extends the life of the blade. The knife handle is resistant, non-slip, made of an inert plastic material, and composed of stainless steel inserts. 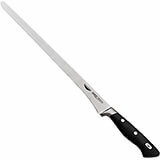 Black, Forged Carbon Steel Ham Slicing Knife, 11.88"
The Paderno World Cuisine 11 7/8 inch ham slicing knife has a forged blade constructed of a special steel and carbon alloy which insures a perfect cut and extends the life of the blade. The knife handle is resistant, non-slip, made of an inert plastic material, and composed of stainless steel inserts. Black, Forged Carbon Steel Ham Slicing Knife, 14.12"
The Paderno World Cuisine 14 1/8 inch ham slicing knife has a forged blade constructed of a special steel and carbon alloy which insures a perfect cut and extends the life of the blade. The knife handle is resistant, non-slip, made of an inert plastic material, and composed of stainless steel inserts. Black, Forged Carbon Steel Ham Slicing Knife, Granton Edge, 10.25"
The Paderno World Cuisine 10 1/4 inch scalloped ham slicing knife has a forged blade constructed of a special steel and carbon alloy which insures a perfect cut and extends the life of the blade. The knife handle is resistant, non-slip, made of an inert plastic material, and composed of stainless steel inserts. Black, Forged Carbon Steel Ham Slicing Knife, Granton Edge, 11.88"
The Paderno World Cuisine 11 7/8 inch scalloped ham slicing knife has a forged blade constructed of a special steel and carbon alloy which insures a perfect cut and extends the life of the blade. The knife handle is resistant, non-slip, made of an inert plastic material, and composed of stainless steel inserts. 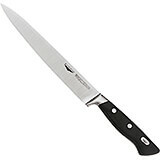 Black, Forged Carbon Steel Ham Slicing Knife, Granton Edge, 14.12"
The Paderno World Cuisine 14 1/8 inch scalloped ham slicing knife has a forged blade constructed of a special steel and carbon alloy which insures a perfect cut and extends the life of the blade. The knife handle is resistant, non-slip, made of an inert plastic material, and composed of stainless steel inserts. Black, Forged Carbon Steel Salmon Slicing Knife, 11.88"
The Paderno World Cuisine 11 7/8 inch salmon slicing knife has a forged blade constructed of a special steel and carbon alloy which insures a perfect cut and extends the life of the blade. The knife handle is resistant, non-slip, made of an inert plastic material, and composed of stainless steel inserts. Black, Forged Carbon Steel Salmon Slicing Knife, Granton Edge, 11.88"
The Paderno World Cuisine 11 7/8 inch scalloped salmon slicing knife has a forged blade constructed of a special steel and carbon alloy which insures a perfect cut and extends the life of the blade. The knife handle is resistant, non-slip, made of an inert plastic material, and composed of stainless steel inserts. 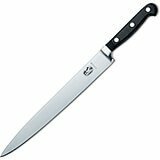 Black, Forged Carbon Steel Slicing Knife, 10"
The Paderno World Cuisine 10 inch slicing knife has a forged blade constructed of a special steel and carbon alloy which insures a perfect cut and extends the life of the blade. The knife handle is resistant, non-slip, made of an inert plastic material, and composed of stainless steel inserts. Black, Forged Carbon Steel Slicing Knife, 11.88"
The Paderno World Cuisine 11 7/8 inch slicing knife has a forged blade constructed of a special steel and carbon alloy which insures a perfect cut and extends the life of the blade. The knife handle is resistant, non-slip, made of an inert plastic material, and composed of stainless steel inserts. Black, Forged Carbon Steel Slicing Knife, 5.88"
The Paderno World Cuisine 5 7/8 inch slicing knife has a forged blade constructed of a special steel and carbon alloy which insures a perfect cut and extends the life of the blade. The knife handle is resistant, non-slip, made of an inert plastic material, and composed of stainless steel inserts. Black, Forged Carbon Steel Slicing Knife, 7.88"
The Paderno World Cuisine 7 7/8 inch slicing knife has a forged blade constructed of a special steel and carbon alloy which insures a perfect cut and extends the life of the blade. The knife handle is resistant, non-slip, made of an inert plastic material, and composed of stainless steel inserts. Black, Stainless Steel Ham Slicing Knife, 12.25"
This ham slicer combining tradition and quality is made in Germany by Giesser Messer, cutlers since 1865. Vacuum-treated stainless steel blades ensure improved cutting. High-quality chrome/molybdenum steel. Non-slip, non-porous, sterilizable handles. The handle's shape in this slicer knife ensures user comfort regardless of the type of use. Length of blade 12 1/4". Black, Stainless Steel Ham Slicing Knife, 9.75"
This ham slicer combining tradition and quality is made in Germany by Giesser Messer, cutlers since 1865. Vacuum-treated stainless steel blades ensure improved cutting. High-quality chrome/molybdenum steel. Non-slip, non-porous, sterilizable handles. The handle's shape in this slicer knife ensures user comfort regardless of the type of use. Length of blade 9 3/4". Black, Stainless Steel Serrated Ham Slicing Knife, 12.25"